Yesterday, we highlighted some incredibly hitting performances in the Twins minor league system. Ryan Jeffers was named the Twins Daily Minor League Hitter of the month, but there were several strong candidates. Today, we take a look and highlight the top starting pitcher performances of the month. Like with the hitters, there are a lot of pitchers who were seriously considered for the top spot this month. Before we share our choices for the Twins Minor League Top Five Starters for July, there are some terrific starting performers that just missed the cut. The Twins drafted the 6-8 right-hander in the 15th round of the 2016 draft out of Cal State-San Bernadino. Wells was our choice for Twins Minor League Starting Pitcher in June, and he was very good again in July. Opponents hit just .183/.230/.329 (.559) off of him during the month. He struck out more than a batter per inning, and he showed very good control. Wells has worked very hard and lost about 50 pounds since being drafted, including about 30 pounds since last season. The results have shown for him, and as July was coming to an end, he received a promotion to Chattanooga. Dobnak was signed just over a year ago out of the independent USPBL. Ever since, he has been a stable, consistent arm, mostly for the Cedar Rapids Kernels. In his July starts, the Alderson-Broaddus College graduate continued that trend. All four of his starts were quality starts. He averaged over seven innings per start and went at least 6 2/3 innings in each start. In fact, he has completed at least six innings in his last eight starts. The 23-year-old has a full pitch mix. While he doesn’t usually top 92 with his fastball, he has four good pitches. For the 22-year-old Australian,Thorpe has really made adjustments and improved over the course of the season at AA Chattanooga. The best way to illustrate that improvement might be by showing his OPS against numbers by month. In April, opponents posts a 1.020 OPS off him. In May, .839. June? .612. And in July, opponents hit just .171/.188/.232 (.420) off of the southpaw. Thorpe represented the Twins and Australia on the World team at the Futures Game. And the reasons for his improvement in July are clear. He didn’t give up many hits. He walked very few, and he struck out more than a batter per inning. Thorpe was added to the Twins 40-man roster last November. With the way he’s pitching, he could be debut with the Twins sometime in 2019. While Gonsalves could make a case to be the July pitcher of the month, it is more important to see just how well he has pitched of late. While the award might be nice, the reward Gonsalves likely wants most would be his first big-league promotion. That should be coming soon. It’s no secret that Gonsalves has had some highs and lows already this season. However, in his past eight starts, Gonsalves has gone 3-0 with a 0.78 ERA. In 46 1/3 innings, he has given up 23 hits, walked 22 and struck out 37 batters. He has given up zero home runs. The walks have been an issue throughout the season for Gonsalves, but in his past two starts, he has a total of one walk in 13 innings. Gonsalves looks the part of a major-league starting pitcher. He’s long and lean, and he’s got a smooth delivery. He’s got a plus-curveball and a solid, very slow curveball. He’s added a cutter/slider which all helps him miss bats with his low-90s fastball. There is no reason for Gonsalves not to make his debut within the next month. Ober was the Twins 12th-round draft pick in 2017 out of the College of Charleston where he was national freshman of the year, but then he needed Tommy John surgery. He missed more time with other injuries. When healthy, the 6-8 right-hander has a lot of potential. He hyper-extended his knee in spring training and stuck in extended spring for about six weeks. He joined the Cedar Rapids Kernels in late April. In his Kernels debut, he gave up six earned runs and got just two outs. He gave up four runs in four innings during his second start. In his third start, he gave up four runs in five innings. However since that time, Ober has been one of the better, more consistent starters in the Twins farm system. In July, he was dominant in his first three starts. In his first July start, he went seven innings and struck out 12 batters. In his next start, he struck out ten batters in 6 2/3 innings. In his third start of the month, he struck out 12 batters in eight innings. That’s right. He struck out 34 batters in 21 2/3 innings over just three starts. And he walked just two during that time. Unfortunately in his final start of the month, July 27, Ober went just three innings before leaving the game. He was placed on the disabled list the next day with an elbow strain. He recently had and MRI to see what was going on. Results of the MRI have not yet been made public. Obviously we wish him the best. 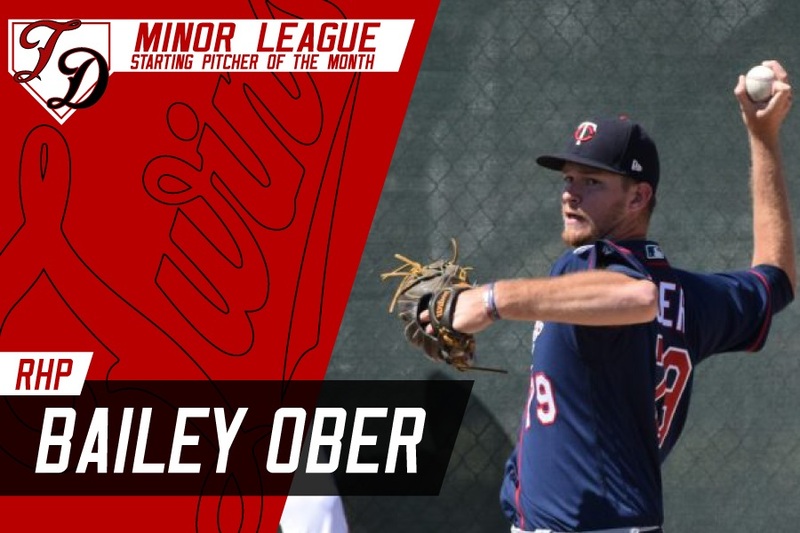 Congratulations to our Twins Daily Minor League Starting Pitcher of the Month of July, Cedar Rapids Kernels right-hander Bailey Ober. What a sad ending. Pitcher of the month and now waiting for an MRI. I do hope they give Gonsalves a look, it feels like the team looks around and past him. I think he deserved a shot before Littell and Slegers. I was thinking while reading this report, Seth, that I had read that Ober was on the DL.When reading about him and the elbow, my only comment was BAH HUMBUG!Hopefully, with one TJ surgery behind him, that isn't what's going on this time. What didn't compute for me was Wells 3.52 ERA and 0.78 WHIP.Didn't go back and look, but must have been a couple of home runs in there some where. And some really nice performances by that HM group.Why do you think we haven't seen Gonsalves at Target Field, Seth?Has it been the walks? Here are the totals for the 14 pitchers listed above. IP: 338.7 ERA: 1.86 WHIP: 1.01 K/9: 8.00 Those are some pretty impressive numbers. And no Brustar Graterol or Fernando Romero. The Arm-y looks promising. I hope the Twins can hit it big on one or two for 2019. In our small market, we are far more dependent on call ups than free agent signings, although I suspect we will have one or two signed in the coming off season. The rotation for 2019: Berrios, Romero, Santana (likely not extended),.. Pretty cool to see Amsterdam native Donny Breek get a mention. Lots more info on him here. Lots of data and nice, concise write-ups. It looks like a lot of work, Seth. Please know it is appreciated. Thank you! I guess sleep is overrated. Ha! Yes, Wells gave up a 3 run shot and a couple of solos. That is what killed the ERA, otherwise he's probably in with a sub 2 ERA and a whip in the basement. Oh man that SUUUCKKKKS. Is it looking like another TJ or was to for something else? Here are the totals for the 14 pitchers listed above.IP: 338.7ERA: 1.86WHIP: 1.01K/9: 8.00Those are some pretty impressive numbers. I'd like to see them be more aggressive in 2019.Berrios, Romero, Gibson, Gonsalves, Meija with Thorpe in AAA.I have my doubts that Santana is here in 2019.